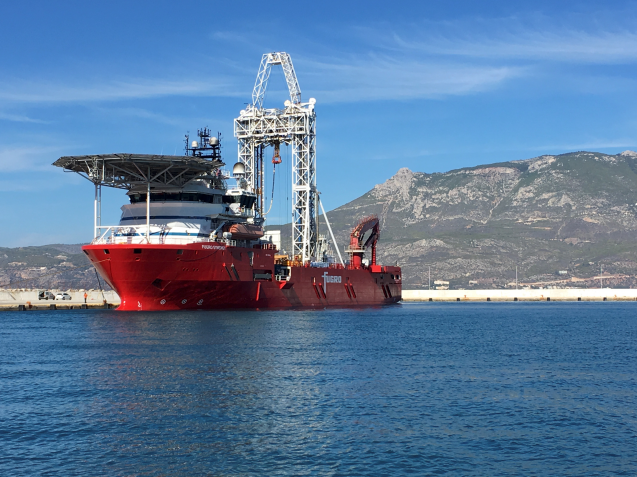 Newly analyzed drill cores taken from the bottom of Greece’s Gulf of Corinth show that sediment flow into the basin has varied dramatically over the past 500,000-plus years, as the earth passed in and out of ice ages, and humans later dominated the surrounding landscape. The cores are the first to be taken from such a feature, where the earth is actively splitting apart and creating a new ocean basin for sediment to spill into. Among other things, the results may have a bearing on hydrocarbon exploration. The Gulf of Corinth is an inlet of the Ionian Sea penetrating deep into central Greece, nearly cutting off the Peloponnese peninsula from the mainland. Formed by the rifting of two tectonic plates, it is geologically young and still widening by about 10 millimeters (.39 inches) each year. Such young rift basins are known to be sensitive recorders of past changes in climate and sea level, and of the chemical and biological conditions of the waters they contain. The scientists found that two to seven times more sediment flowed in during ice ages than in warmer times, probably because there was less vegetation around. More recently, sedimentation has ramped up even though it has been warm; for this, scientists blame humans.The observations are important for understanding the impact that global climate fluctuations have, particularly for the earliest sediments deposited as new ocean basins form, they say. The process of continental rifting is fundamental for the formation of ocean basins, which are the source of a large proportion of the Earth’s hydrocarbon resources. The changes were more dramatic and complex than the scientists anticipated. “This is the first long and high-resolution sediment record of the early rifting process ever obtained,” said McNeill. At one site, a 700-meter section of core recorded 800,000 years of history, she said. During that time, the gulf switched from being an arm of the sea during warm periods, when sea levels were higher, and being a lake in cold times, when sea level dropped, and it was cut off from the ocean. During the latter times, reduced salinity severely restricted the range of organisms that could inhabit the waters. These fluctuations occurred once about every 100,000 years as climate changed. Shillington said that the greater sedimentation during glacial periods probably was caused by a reduction in vegetation cover and the type of vegetation, leading to enhanced erosion. The team also found that the sedimentation rates in the last 10,000 years were much higher than in earlier non-glaciated time periods. This, they said, was probably due to the impacts of humans on mainland Greece, who deforested the landscape and increased slope erosion rates over a period of about 4,000 years. The team consisted of scientists from 11 nations, including Greece.